Gauge: about 3 stitches to the inch, but doesn’t matter so much as it’s a gift bag! In 2nd chain from hook, sc. Dc in next ch, sc in next ch space. Repeat across. In last ch space, make a sc & a dc. Do not join in a circle. Working in opposite ends of the chain, continue sc & dc across. In last ch, dc & sc. Do not join, but work in continuous rounds for rest of pattern. desired height of bag, minus 1”. I worked for about 5”. End with a sc on one side of bag. Eyelet row: ch 1, skip dc, sc in next space. Continue around. End by dc in sc space. established pattern for one more row. End off on side, sl st in next sp, and cut yarn. Weave in ends & enjoy! Many thanks to MissRach, bjclark63, & ClaireA on ravelry for their work in testing the pattern!!! If you are just stopping in, please see day one and day two. Today we are going to decrease. I’m going to show you how to decrease AND do a color change, all at the same time! You can see in the above photo the start of the color change. I ended the old color (the pink) and I’m starting the new color, the blue. I have a slip knot on my hook, and I’m slipping it through the chain space. Now, when we get to the end of this row, we’ll continue in the same color. So, when we get to the corner, we’ll chain one, turn, slip stitch back the way we came, and in that chain space, we’ll continue shelling across as usual. If you DECREASE on one side, and continue INCREASING on the other, you’re creating a bias fabric: in other words, a rectangle. If you decrease both sides, you’ll create a square. Today I’ll show you how to change colors various ways within the corner to corner afghan. Photos are all clickable if you’d like to see larger views, and any questions please ask me! So today we are changing colors. There are different ways of doing this. The technique is all the same, it’s the location that’s different – and thus, the finished look. yarn over hook, insert hook in chain space and pull through yarn (three loops on hook), yarn over hook and pull through one loop (two remaining loops), drop old color/cut old yarn color, pick up new color, yarn around hook, pull through remaining two loops: one loop left on crochet hook. And continue making your shells as usual. That is my least favorite way of changing colors in this pattern/stitch – it’s OK, but I think it looks a little messy. We can do better. Change colors as before, but this time, complete a full shell. Instead of slipping into the next chain space with the old color, pick up the next color, and continue with the new color. My favorite way of changing colors is at the end of a full row, for a nice, clean color change. 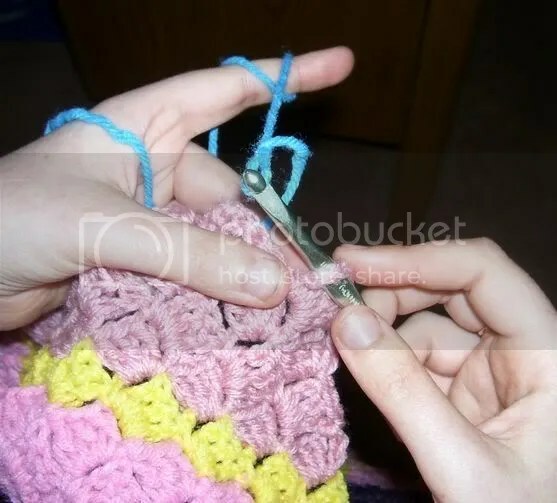 Finish your last shell with your old color, but in the last double crochet of the shell, change colors. Now chain 6 with the new color, and continue as usual. By request, here’s how to make the corner to corner shell stitch afghan. All photos are clickable. Use any yarn of choice, and appropriate size hook. I’m using scraps of worstened weight yarn and a 5 mm hook. Finished size can be adjusted depending on how big you make it (which is why it’s a favorite pattern of mine) or how much yarn you have, etc. 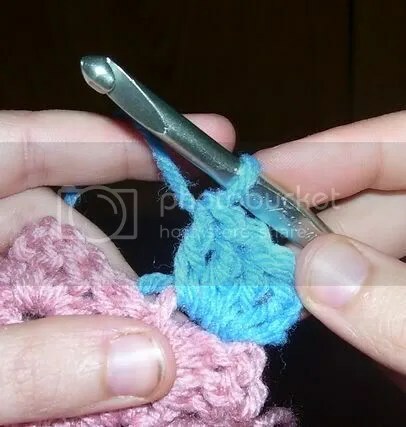 In fourth chain from hook, make one double crochet. In the next two chains, make one more double crochet in each of the two chains. This means you have the turning chain where you skipped your first few chains, and 3 double crochets. This forms your first shell block. 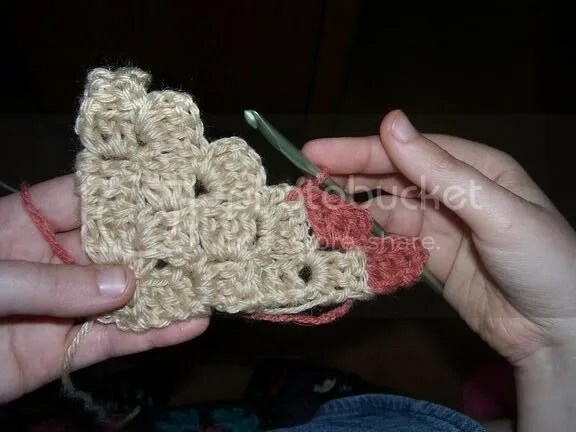 Make one double crochet in the fourth chain from hook & in the next 2 chain spaces. 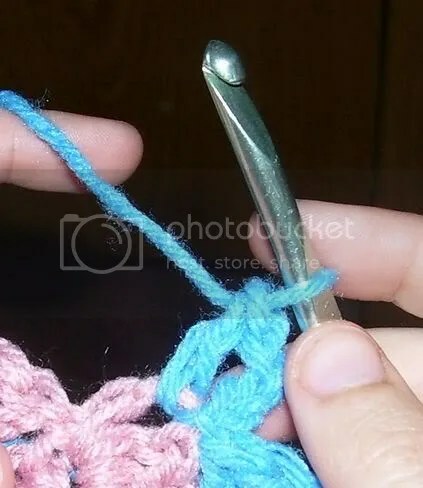 Now, turn that first shell a bit, and slip stitch into the very first chain space (where you skipped the very first stitches). Chain 3, and make 3 double crochet into that chain space. Do you see what we are doing? Each row adds one more “shell”. Chain 6, double crochet into the 4th chain from the hook & into the next two chains. Turn work, slip into chain space that you skipped on the row before. Chain 3, and make 3 double crochets into the same chain space. Slip into next chain space, chain 3, and make your 3 double crochets as before. And just keep going, for as long as you want, changing colors whenever you like/run out of yarn. The rest of this series will include how to turn the square into a rectangle, and how to do the decreases. Ch 4, make 17 dc in 3rd chain from hook = 18 dc. 2 sc in every dc around. End off on first piece, on second one do not end off. You will join the two small pieces together, holding wrong sides together. Ch 1, sc through both thicknesses, ch 3, **sc in next stitch through both scrubbies, ch 3, and repeat around scrubbie. Rnd 4: Insert right hand needle into first two stitches on left hand needle and k1, but leave sts on left needle. Insert right hand needle into first stitch on left hand needle again and k1 and slip the 2 stitches off left hand needle, p2, and repeat across. Increases – I used lifted bar increase (M1) , but use increase method of your choice. Rnd 1: Beginning at toe, cast on figure 8 method 4 stitches on 2 needles. Rnd 4: Increase every other stitch and at the same time, divide onto 4 needles, 4 stitches each needle. Rnd 7: On each needle around, (k1, m1, k2, m1, k1) – 24 stitches total. Rnd 10: On each needle around, (k1, m1, k4, m1, k1) – 32 stitches total. Rnd 13: On each needle around, (k1, m1, k6, m1, k1) – 40 stitches total. Rnd 14, 15, 16: p1, (k2, p2) around, but end last repeat with p1. Rnd 17: p1, Insert right hand needle into first two stitches on left hand needle and k1, but leave sts on left needle. Insert right hand needle into first stitch on left hand needle again and k1 and slip the 2 stitches off left hand needle, p2, and repeat across, but end with p1. Repeat fake cable pattern until foot measures length desired minus 2.5”. Rnd 1: Work across top of foot in pattern (needles 1 & 2). On needle 3, k1, m1, k across rest of needle. On needle 4, k across to last stitch, m1, k1. Work even for one row. Repeat last two rows for desired gusset area – I worked 6 increases on either side of foot for a total of 12 increases and 12 rows. 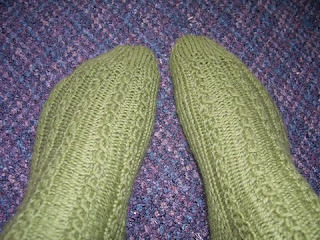 Heel will be worked over sts on Needle 3 and Needle 4, starting on Row 1, below. Row 2: (right side): slip first stitch, knit across next 9 stitches, turn. Row 3: Slip first stitch, purl across next 9 stitches, turn. Repeat rows 2 & 3 three times more, and then repeat row 2 once more. After knitting last row, you will continue along the side of the flap and pick up and knit 5 stitches on the side of the flap. Slip first stitch, purl back the 5 stitches you just picked up, the next 10 stitches from your flap, and pick up 5 more stitches along other side of flap – 20 purl stitches. You are left with your original 20 stitches from the bottom of your foot, and gusset stitches to be decreased away. Sl first st, k1, slip 1 across to last stitch of the heel, and decrease last stitch along with one stitch from gusset. Turn, and purl back, decreasing last stitch of heel with one stitch from gusset. Repeat these two rows until all the gusset stitches have been decreased away and you have only 20 stitches. Knit across the two needles you have been working on, work across the top of your foot in pattern, and continue the pattern around the leg. Knit even in pattern for desired length of leg, minus 2” for ribbing. K2, p2 around. Bind off loosely, using Elizabeth Zimmermann’s sewn bind off, or other bind off of your choice. granny square coasters – great for bazaars! Ch 5, join with a slip stitch. *3 dc in lp, 2 ch*; Repeat * to * 4 times ; slip stitch to first dc. *(3dc, 2ch, 3 dc) = corner in next sp, 1 ch*; Repeat * to * 4 times ; join with slip st.
Ch 1, sc in every dc around, working 3 sc in every corner. Feel free to use this pattern to make items to sell at local craft shows & bazaars. Do not sell online. If using for charity, please let me know which one! Rnd 1: Ch 2, 6 sc in 2nd chain from hook. Work in continuous rounds, mark beg with a stitch marker & continue. Rnd 6: Ch 3 (counts as first double crochet now & next round), 1 dc in next 3 sc, ch (counts as increase), do NOT skip sc but in the next sc, dc in next 3 sc, *ch 1, work 3 dc, and repeat around from *. Rnd 7: ch 3, dc in next 3 dc, ch 1, ** dc in next 4 dc, ch 1, rep around from **. Final round: work sc in every stitch around. Using size 5 DPN (or do 2 at once ala 2s2c, or magic loop), cast on 24 (28) stitches, with one strand of novelty yarn & one strand of the wool. Join mohair, and knit plain for 4 inches. Bind off using E. Zimmermann’s sewn bind off, or method of choice. 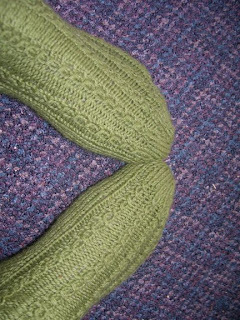 Please consider making a pair for charity, as this pattern was originally intended.